Wondering who de Bremond was and the role he played as one of the early 20th century Karakul pioneers turned out to be a quick but fascinating study in New Mexico history. In August 1894 Charles married Charlotte Scarritt from St. Louis, Missouri. There two daughters, Marie and Edith, were born. Two months after the birth of their second child, May 1900, the family was back together in Roswell settling into farm life with two household servants. It was also in 1910 that the decade-long armed struggle called the Mexican Revolution began. Charles was a military man with almost every article referring to him as Captain. His rank was soon to be elevated. So was his breed of sheep. A quick political announcement – New Mexico became the 47th state on January 6, 1912. Either way, de Bremond and Young must have met and discussed the next planned trip to Asia for the second (1912) importation of Karakul sheep with the favor of trip financing deliberated. 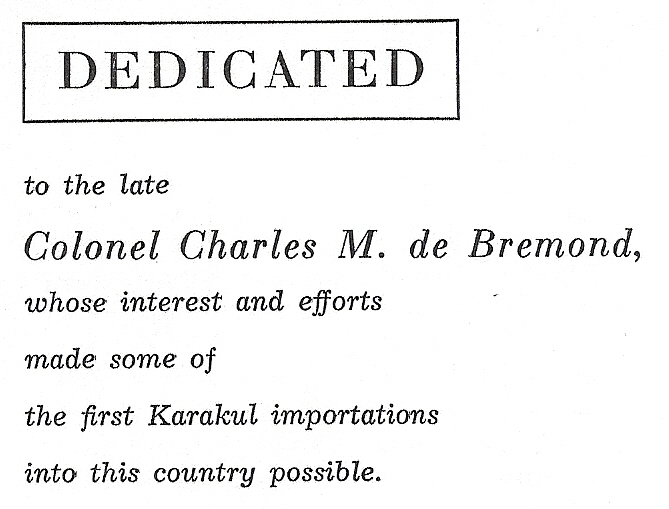 This would make sense as to Lowry’s dedication “…de Bremond, whose interest and efforts made some of the first Karakul importations into this country possible.” After Young returned, he exclusively acknowledged de Bremond in his writings. Thus, after Dr. Young returned from his 1912 expedition, he mentioned de Bremond at least twice, once in a major scholarly journal. The theory of trip financing appeared more probable, but there was still something incomplete, missing in the enigma. Charles was a Captain of the New Mexico National Guard’s Battery A, Field Artillery. de Bremond and his unit served during the Mexican Punitive Expedition and in France during World War I. He had been elevated three times in rank from Captain to Colonel. WWI ended November 11, 1918. Charles de Bremond died just eleven years after the onset of the U.S. Karakul fur sheep industry, when it was still in its infancy. He was involved almost from the beginning, just three years after the first import; thereby giving his family and shepherd/ranch hands eight years of experience with Karakul sheep before his passing. Even though the de Bremond and Hagerman families were “neighbors” somewhere along the several hundred miles of Pecos Valley, there still seemed a puzzle piece was missing from Lowry’s dedication. It read like there was something more, besides financing C.C. Young’s second and third expeditions to Asia to import additional Karakul sheep. The mystery was finally solved doing a Hagerman family search . Lowry Hagerman married Marie de Bremond, Charles’ oldest daughter, thereby “inheriting” a pioneer Karakul sheep flock, which he clearly embraced. Lowry Hagerman dedicated The Karakul Handbook to his father-in-law. Eddy County Citizen, July 30, 1892. “New Mexico, Deaths, 1889-1945,” index, FamilySearch (https://familysearch.org/pal:/MM9.1.1/FLYB-NSS : accessed 5 January 2015), Lowry Hagerman in entry for James John Hagerman, 26 Oct 1936; citing Armijo Ranch, Santa Fe, New Mexico, reference cn 5340, Bureau of Vital Records and Health Statistics, Santa Fe; FHL microfilm 1,913,302. Young, C. C. Some Facts about Karakule Sheep. Holliday, Tex. : [C.C. Young], 1909. Jack O. Loftin, “ALBRIGHT, ALEX,” Handbook of Texas Online, http://www.tshaonline.org/handbook/online/articles/fal82, accessed December 12, 2014. Uploaded June 9, 2010. Published by the Texas State Historical Association. Young, C.C. “Karakule Fur, Produced in Texas.” Farm and Ranch, March 4, 1911. Carlsbad Current, December 12, 1919, Obituary sec.